It is dark. My torch struggles to illuminate anything beyond my feet. It is cold. My scarf, woolly hat, gloves, thermals and five layers of clothes struggle to keep out the chill, let alone keep me warm. It is impossible to see where the pilgrim’s path, the Kora, begins. My eyes scan the gloom, trying to make out the form of a monk that I can follow to the start of the route around the Labrang Monastery complex. The only figure visible is a lone road sweeper, disturbing dust with a long wicker broom. As the cloud settles, a monk materialises. Then another. An old Tibetan woman emerges too, her body a permanent right angle, propped up on a walking stick. I follow them. The moon is a thin crescent over the impenetrable black of the hills, the stars still bright above. 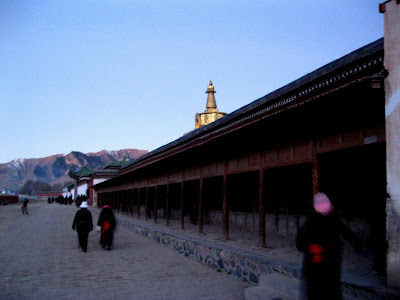 The first corridor of prayer wheels appears in the half-light. I follow the line of pilgrims, observing then mimicking, as they set each ornate cylinder spinning in turn. I am part of a procession, like them I press palms, push, pull these wheels into motion as if my karmic balance depended on it. 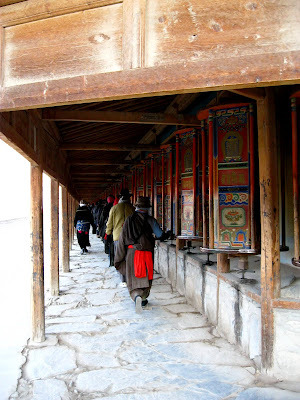 Every 150 metres, we enter a room where a much larger prayer wheel waits. In these rooms, it is near pitch black; there is just enough light for me to find the giant wheel and walk around, reaching out to help it spin further and faster. Once, twice, three times around, stumbling, disorientated before being spat out into the new dawn. Sometimes in the crowds, the darkness, the general confusion, I trip over a pilgrim prostrating beneath me. Lost in a religious fervour, these figures kneel and then lie in the dust before scraping themselves along the dirt track. Some have wooden paddles on their hands and circles of padded fabric to protect their knees, others do not, but they, as I, must carry on until the Kora is complete. The sun is now fully up. For the first time I can see the hundreds of pilgrims around me clearly – red-robed monks, long-sleeved Tibetans, Yoda-like elderly women, walnut-faced men, all clutching prayer beads in their left hands and chanting with each step. I can also see the points on the monastery walls which have been rubbed into three shiny patches – a head and two hands – where the faithful press their foreheads against the cold stone with their palms placed either side. 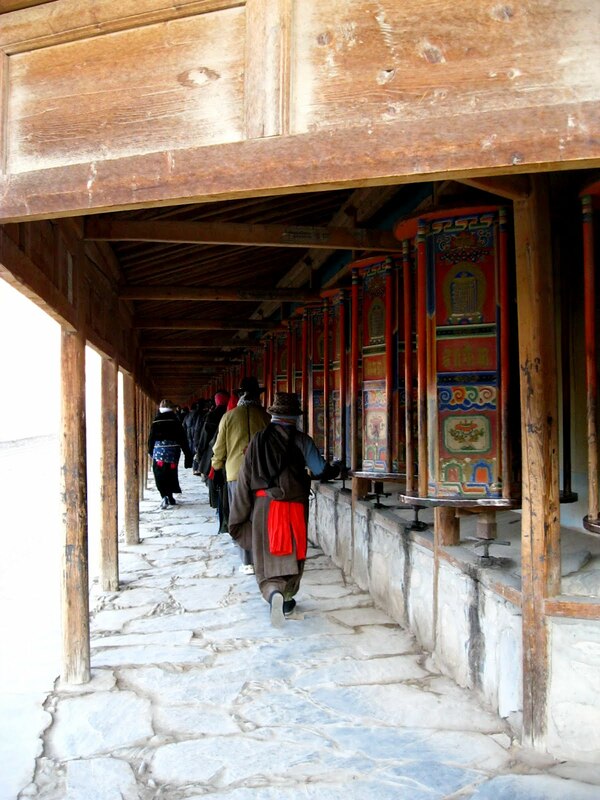 The journey continues for three kilometres and over 1100 prayer wheels. I touch each one, helping send it and the prayers it contains on to further revolutions. When the Kora comes to an end, when I have spun the final wheel, I instantly miss the feeling of being swept along in that tide of such calm, focussed devotion. Although trippy, intense, and disorientating, out of it, I feel like I am drowning.